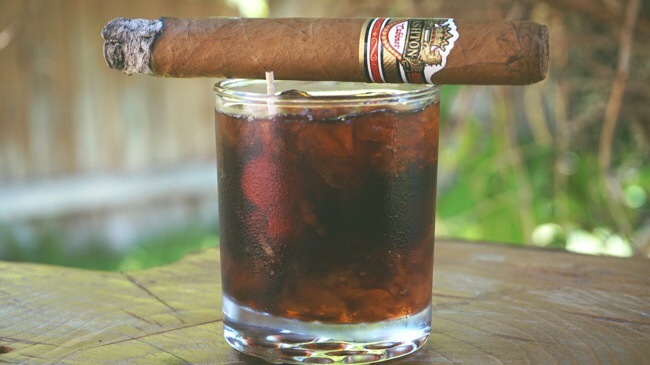 The Ashton Cabinet is a luxury cigar, both in its build and flavor profile. Its tobaccos are aged 4-5 years and it results in a flavorful, mild profile with touches of citrus, honey, cashews and cedar. The Ashton Cabinet is one of hundreds that are available to order from Holt’s Cigar Company. I smoked the Ashton Cabinet in the #7 size, which measures 6 ¼ inches (length) by a 52 ring gauge (thickness). It’s solidly built with a smooth, creamy wrapper with tasting notes of black pepper and nuts. While the overall strength level and flavor profile of this cigar is quite mild, there is a nice, balance selection of flavors to enjoy as you smoke it through. I paired the Ashton Cabinet with a cocktail that’s easy to make: the Black Manhattan. Consisting of 2 oz whiskey (rye or bourbon preferred), 1 oz Averna, 2 dashes of bitters and a cherry garnish, the Black Manhattan turned out to be an excellent companion to the Ashton, as both share a prominent and complementary flavor profile. Averna, an Italian amaro (Italian for “bitter”), is a rich and flavorful collection of herbs and citrus that complemented the Ashton so well, I was pretty shocked. Together, the Aston Cabinet from Holt’s and a Black Manhattan are excellent companions. The intermingling of the nutty and citrus notes and the excellent quality of the cigar ensured a long and pleasant pairing experience. This entry was posted by admin in cigars and tagged ashton, ashton cabinet, ashton cigar, averna cocktail, black manhattan, cigar, cigar pairing, cigars, holt's cigar, holts on July 10, 2017 .